See all 10 winning photos in the slideshow above. 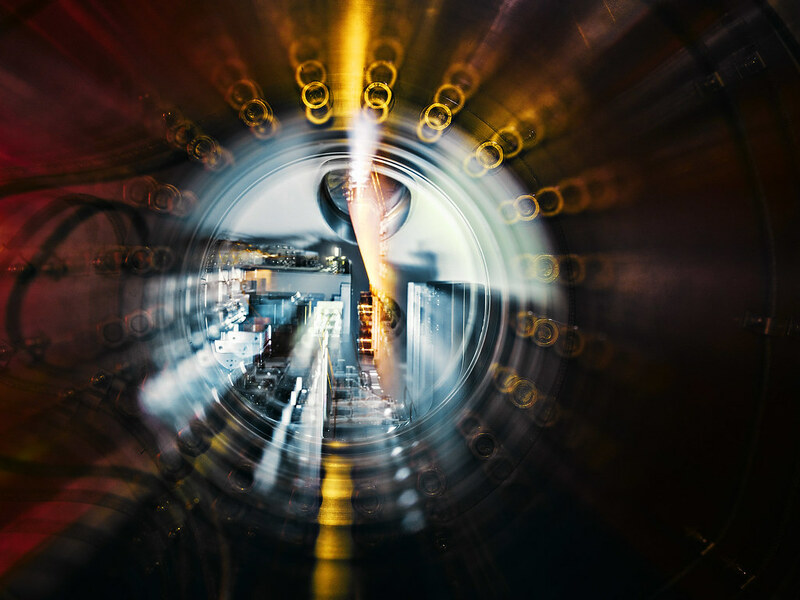 On Wednesday, May 16, the U.S. Department of Energy’s (DOE) Brookhaven National Laboratory hosted 30 amateur and professional photographers for a behind-the-scenes “Photowalk” of the Lab. The photographers were able to explore and photograph major experimental facilities that are not usually accessible to the public, including the STAR detector at the Relativistic Heavy Ion Collider (RHIC)—the only operating particle collider in the U.S.—and the National Synchrotron Light Source II (NSLS-II)—one of the world’s most advanced synchrotron light sources. Both are DOE Office of Science User Facilities. Experiments at RHIC and NSLS-II explore the leading edge of fundamental and applied science. At RHIC, physicists collide gold ions, at nearly the speed of light, to recreate the same matter that filled the universe a millionth of a second after the Big Bang. At NSLS-II, scientists use ultra-bright x-ray light to reveal the chemical makeup of proteins, batteries, superconducting materials, and everything in between. The “Photowalkers” lent their talents to capturing the remarkable design of these experiments, showcasing the facilities in all their scientific glory. After receiving more than 100 stunning submissions, Lab judges selected 10 winning photos. The top three photos will advance to the global Physics Photowalk competition, run by the Interactions particle physics collaboration, where they will go head-to-head against photographs from 12 of the world’s top science facilities. Congratulations to Brookhaven’s overall winner, Joe Caggiano, who captured a striking shot of the Inner-Shell Spectroscopy(ISS) beamline at NSLS-II. Caggiano is a resident of Manorville, NY, and he has been shooting professionally for about five years. Caggiano’s unique portrait of the STAR detector at RHIC also made the top three winning photos. *FINALIST* "X-Ray Eye" by Steve Lacker. Captured at NSLS-II's Soft Inelastic Scattering (SIX) beamline. The third photograph being sent on to the global Physics Photowalk competition was captured by Steve Lacker, an avid travel/nature photographer and a physics teacher at Westhampton Beach High School. His photo features an intense view of the Soft Inelastic X-ray Scattering (SIX) beamline at NSLS-II. Five other talented photographers won places in the top 10: Gisel Florez, Philippe Cheng, George DeLucia, Steven Schreiber, and Colleen Kelly. Congratulations to all! See all the winning photos in the slideshow above and on the Photowalk website. News Release: "Global Physics Photowalk 2018"